Today's project is vines. Jungle vines. Twisty, knotty, trailing vines with leaves. - Scraps of binding in shades of brown and dark forest green - ripped down the fold of the binding to create two LONG 1 1/4" strips. - 1 1/4 WOF strips of fabric in medium green with a dark leaf pattern all over left over from the Munchkin's curaains, and bright olive. - oval "leaf" shapes out of a solid green poly blend that was used as the lining for the same curtains. Tie knots in the fabric about every 15" with one or two leaves caught in the knot. Repeat. 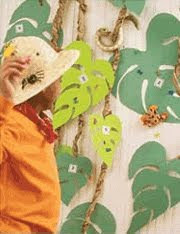 Decorations for a "Jungle Expedition" birthday party. This party at Family Fun. Photos to follow in mid-February when the whole thing is assembled. A large amount of hard to use fabric has been BUSTED in the process! Woo hoo! Tonight I worked on my Tiger Twiddle. This wall hanging started out as randomly sewn orange/brown and white scraps, which became 4 patches, which became this checkerboard. The school colors where I work are orange and brown, and our mascot is the tiger - so I began envisioning adding a tiger to this using some tiger print fabric I had in my stash. I found some clip art of a tiger online that would work good in outline only, and pulled out the fusible, and went to town. I was totally flying without a firm plan - I even ended up with a square when my original layout on the floor was a rectangle - and I wondered why I was one 4-patch short. And the borders were pulled from my stash AFTER the rest of everything was pieced. I have some dark brown leftover binding from a prior project that I think will be long enough - otherwise I think this will be bound in a dark rusty orange. 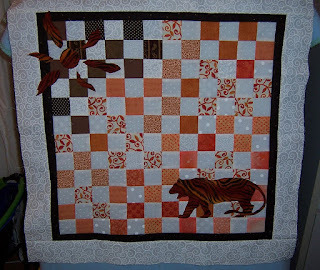 Once I started placing things, the tiger looked a little lost on the big square -in fact the whole thing seemed a bit unbalanced, so I took the scraps of fabric with the double sided bond on the back from cutting out the tiger, and created this "sun." If you have followed my quilting for a while, you will notice I do not do a lot of FMQ. 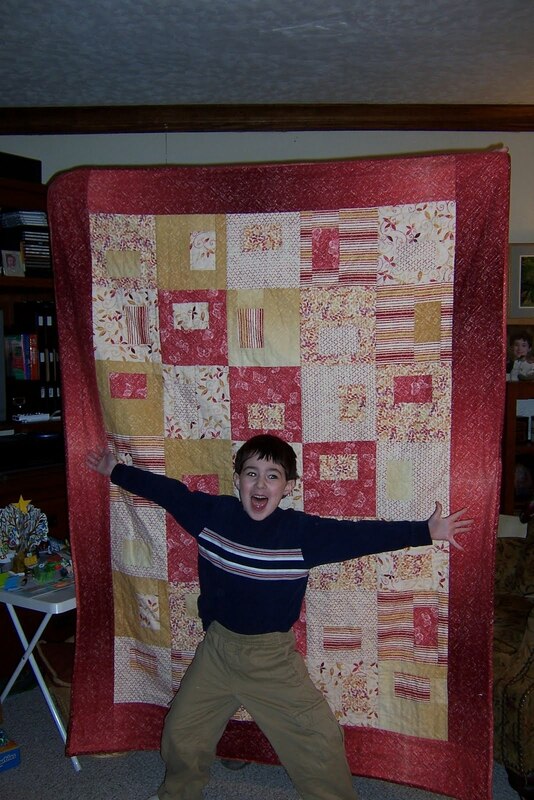 Part of it is lack of practice = lack of confidence, and part of it is lack of throat/work space on my machine, which is not set into a work table, and does not have an extension table on it, so I am reluctant to commit to wrangling a large quilt with those "challenges." 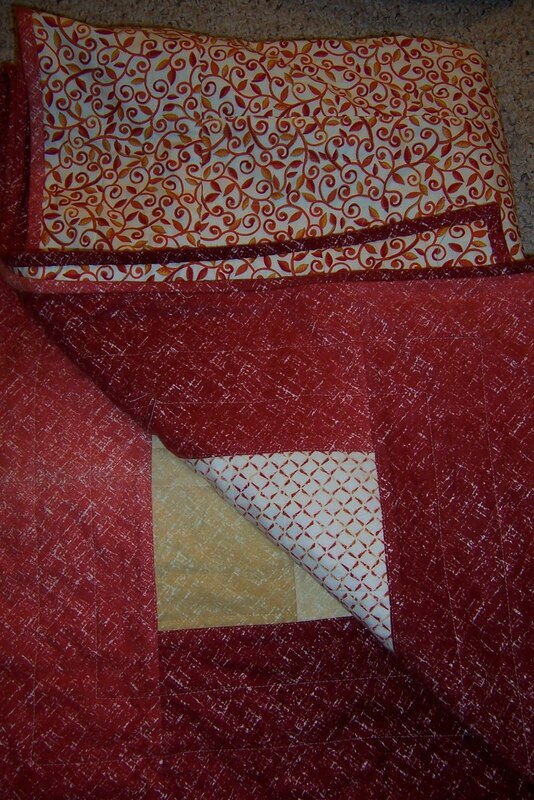 But this was little - so I thought it would be good practice, and good fun, to FMQ this piece. It is for me to hang in my cube at work, so I knew the recipient would be fairly forgiving. So once I got past the frustration of sewing the wrong two edges when piecing some scraps of batting (aka flannel) for the inside and having to rip before I even got started, I got the whole thing sandwiched, pinned, and then I went to town. Then I did the sun. That was fun because I just did flaming petals and did not mind of they crossed or not. It was a fun "organic" shape to work with. I need to work more on transitions but for an 'artsy' piece this worked. 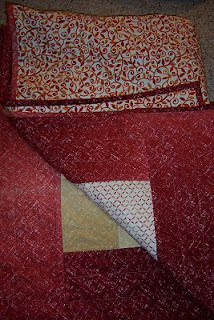 Then I decided to switch to a different color thread and echo quilt the entire thing - since I wanted to have the orange "flames" stand out and I was afraid the same color quilting for the echo would blend it all together too much. That was fun - but a bit frustrating as I kept losing track of where my last line was, and getting very close to it - even crossing it a few times. I also learned lots about my tension, my speed, and my eyes... which I think were crossed by the time I got to the end. I still need to think about how I want to quilt the borders. I tried to see if I could do without -but they are a bit too wide, and there is a bit of a ripple going on in one, so I need to do something with them. I think I will ponder the possibilities and sleep on it - and look at it again tomorrow. I hope to get this finished and bound and hung up on Monday morning. Hoping that participating in the Friday Night Sew In tonight will keep the momentum from last night going... I nearly finished a project last night so optimism is high!!! PIGS - a herd? a litter? a pod? What do you call a group of PIGS? Is it a herd? A flock? A crowd? When it comes to sewing PIGS, Jill is asking... how many do I have? do I keep a list of them? and what is my oldest? And the answers are "I don't know." "No." and "Hmm....."
I have been quilting for about 13 years now - and I do have a UFO from the one and only quilting class I have ever taken - but for a while I was finishing every project I started, and was making quilts for specific gifts, specific recipients, and making them one at a time. I even - gasp - bought fabric just for that specific project, and had no real stash to speak of - other than some leftover bits from previous projects, and clothing sewing. OK -back to PIGS. I have a few Lazy Girl bags that are PIGS, and a whole bunch of quilts that are in the UFO stage. The oldest UFO's??? Those would have to be the quilt blocks we "inherited" when we bought our house in an estate sale - cathedral window blocks that a relative of the previous owners asked me to consider finishing. Next oldest are blocks that my mom started in 1986 - and recently passed along to me to finish. (sorry - no photos of either). The oldest UFO of my own origin is a quilt I started 2 years ago when I attended a retreat with Jill - it is all assembled and only lacks quilting. And just what do you call a group of PIGS? I think that in my case - Parcel and Passel are both VERY descriptive!!! ...and a bit out of sequence. Tonight I did blocks 1, 2 and 4. Block 3 is a pretty involved paper piecing situation, and working at it at 9:45 PM on a Sunday night after a fairly busy day, after having already messed up ONE paper piecing attempt, was not in the cards. I opted to skip over and do 4, and go back to 3 when I am feeling fresher. I have quite a bit of the pink floral and green fabrics and plan to use them on as many blocks as I can. I also have pink solids and yellow solids that I got in a 'stash reallocation' from Jill - as well as some more green that will compliment these - so I am hoping to take these colors as far as I can go. Since the final layout of these blocks will probably NOT be in numerical order, I think I will be OK.
Now to just keep on these on a regular basis - these three took me a little over an hour - and part of that was pulling things together - so I should be able to plug away at things.... right?!?! The official title of this quilt is "The Last Quilt of the Year" which really should be said to music, as Chris Isaac's "The Last Month of the Year" was the favorite holiday tune of the Munchkin this season, and I got it stuck in my head.... bad! But it is also the "Last/First" quilt as it was begun in the last week of 2010, but not completely completed until the first few days of 2011. This was fabric I purchased during my "hop" in July - it was so new in the shop they had not even cut FQ's of it yet and it just fell off the shelf into my arms. It had PIGS status - still in the bag from the store - until I was moving it around the day after Christmas and realized the Happy Hour Snapshots I had just used for another quilt would work well with the flannels due to the minimal seams - and would also show off the larger scale prints of this fabric nicely. So the day after Christmas I spent a bit of time in the afternoon doing some cutting, and that evening after the Munchkin was in bed I had 36 blocks stitched up and waiting for "math class." See -the Munchkin had decided he wanted to play "school" during his break from school. With a new Wii to double for "gym class" and some thank you cards to work on for "writing class" - I thought that working on laying out a pattern and counting blocks would be a great lesson for "math class." 1: follow the pattern of where the inside rectangle is in each block. We went top, left, bottom, right across each row. 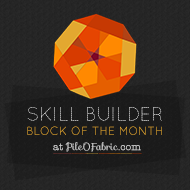 2: Don't put more than one block of any fabric in each row. 3: Don't put any of the dark pink blocks in an outside edge or row so that they don't blend in to the border fabric. I am a bit biased -but I think he did a great job! The backing fabric was a fortunate find. I had popped in to an out-of-the-way, very small JoAnn's back in early November to "pick up some thread" for the other Snapshots quilt, and discovered that their clearance red tag fabrics were an additional 50% off that day. This store gets a lot less traffic than the other stores I shop, and their selection of clearance quilting cottons was VERY good! I quickly filled my arms and wished I had grabbed a cart. I picked this orange vine fabric up and bought the bolt - thinking I would use it for backing fabric on another project - but the colors matched so nicely that I used it on this. The Munchkin had requested "fluffy fabric" on the front (flannel) and "smooth fabric" on the back - so that is what I did - with another layer of flannel in the middle. The quilt still needs a good washing for a good crinkle, but it's been "field tested" by both the Munchkin and I and seems to be working just fine! The fabric line for the flannels is "Ice Garden" by Maywood Studios. 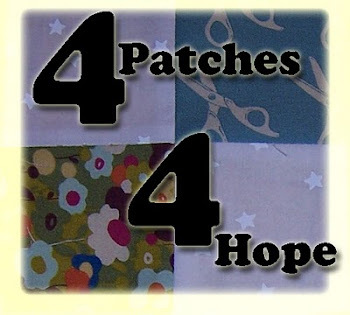 (note -this link is NOT where I purchased the fabric -but shows the entire line in one link). So one less PIGGY in my craft room - one more quilt on the sofa - although the Munchkin wants it for his bed, too!!! 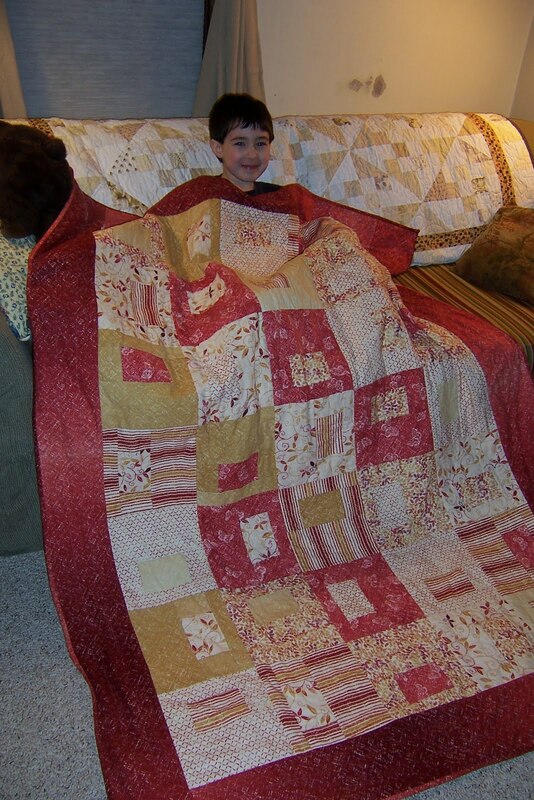 Happy New Year - Happy New Quilt! P.I.G.S - where do they live? 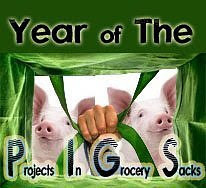 Welcome to the Year of the P.I.G.S (projects in grocery sacks) - sponsored by Jill at Ramblings of a Fabric and Yarn Obsessor. Jill has asked us to write a bit today about how we store our PIGS -and how we keep them separate from the rest of our stash of fabrics and "stuff." She also asked for photos - which she is not going to get... at least not in this post. So - how do I store my PIGS? 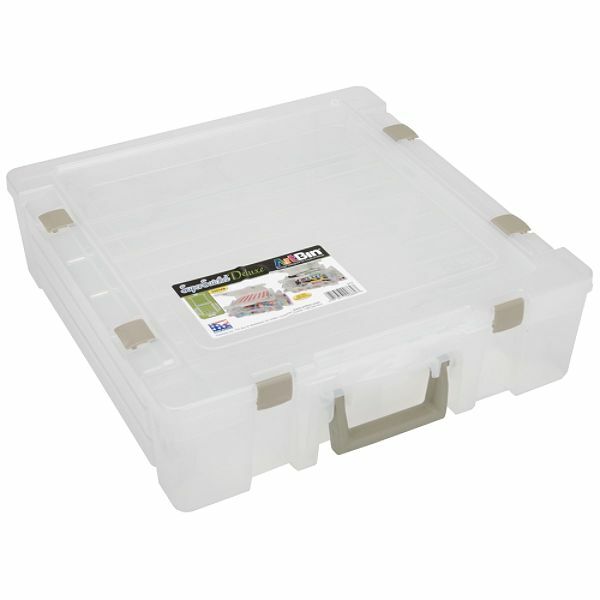 1. plastic shoeboxes -clear sided. These mostly hold my precut scraps (cut to various sizes for future use) but a few hold unfinished projects. The great thing about these is that they stack easily and fit on my shelving units. They are also clear so I can see into them to see what project is lurking there. 2. "Take and Toss" containers - the ones made by Ziplock or Glad or the generic ones sold by my grocery store or Target. I usually get the ones that are about 4x6" and about 5 inches deep. These usually hold small scale projects, or scraps precut for a particular pattern that I make a lot of, like Lazy Girl Wonder Wallets, or mini composition book covers or sachets. I often write on the lid the dimensions of the scraps I need to cut to make those projects so when I am trimming leftovers I can just trim and drop them in for later assembly. 2. Art Bins - I only have 2, but they work! 3. Storage bags that sheets and blankets come in - those heavy squared off vinyl bags with the zippers. They are great for larger projects. 4. Zip top bags - the ever present zip top bags. I like these because I can write notes on them as I go along. 5. Fabric reusable grocery bags -these are also good for larger projects, backings and battings, take and go projects. I can also hang these from hooks in my closet. and last but not least... 6. The bag the fabric came in from the store. Yes - some of them have never even made it out of those bags. Have you noticed how all the sales in 99% of the stores in January revolve around two items - fitness equipment (post Christmas Cookie Guilt perhaps) and plastic storage item. This year our fitness equipment is revolving around the Wii we got for Christmas, with lots of boxing, bowling and golf taking place in our house, and more to come when Mommy can score a Wii Fit on sale. Organization has always been pretty good here - we love our flip top lugs, our clear plastic "shoeboxes" - and thanks to Jill, we are now hooked on 12x12 Art Bins. Not for organizing our crafting supplies... although 2 of the 16 we now own are MINE... no - we use our art bins to organize our LEGO!!! Many many moons ago - I organized all my LEGO by size and shape and piece type - tucking them neatly into fishing tackle boxes - tackle boxes that did not stack, tackle boxes that you had to open to see what was inside, and tackle boxes that rapidly became too small for the enormity of the task. When Jill gave me an Art Bin for my quilting last year, Hubby started eying them for LEGO storage -and a few good sales gave us the opportunity to make the big switch. Two of the three tackle boxes have now been "retired" and we are working through the last box, plus a few more tubs and bins and boxes of unsorted pieces and parts from then and now. It's a big task, but the Munchkin loves to sort, and the boys have it down to a science now.